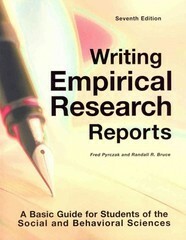 Writing Empirical Research Reports 7 Edition Designed for students who will be writing research proposals, reports, theses, and dissertations. The 15 chapters cover 191 guidelines for effective scientific writing. The guidelines are fully illustrated with easy-to-follow examples. The guidelines describe the types of information that should be included, how this information should be expressed, and where various types of information should be placed within a research report. End-of-chapter questions help students master the writing process. The Seventh Edition contains updated examples throughout.